A group of MIT students demonstrated Wednesday to protest the presence of recruiters from the Central Intelligence Agency (CIA), which conducted employment interviews on campus that day. The protest had two major goals, according to Adam Grossman '87, one of the protestors. "One is to show the MIT community, especially the administration, that a large portion of the community is opposed to the idea of allowing this group of criminals to recruit on campus," he explained. "The second is to educate the people about the CIA." The demonstrations, partly organized by the student Committee on Central America, started in the morning outside the Office of Career Services (OCS) in Building 12, according to James Olivieri, chief of Campus Police. Approximately 10 of the protesters entered OCS around 9:30 chanting slogans and carrying placards, said Robert K. Weatherall, director of OCS. The demonstrators disrupted the office, so "we asked them to leave, and they did," Olivieri explained. "It was orderly and they made their point," he continued. "There were no problems." "We didn't let it disrupt the interviewing," Weatherall commented. 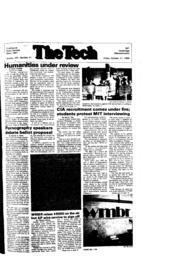 About a dozen MIT students interviewed with the CIA, Weatherall said. MIT's policy since 1969 has been to allow all organizations that are genuine employers to recruit on campus, according to Weatherall. This policy allows all governmental organizations to conduct interviews here. "Students have every right to protest, but they can't disrupt our service to the students that do want to talk to the CIA," Weatherall explained. Some of the protesters entered lecture classes in the morning dressed in military attire and announced their oppostition to on-campus CIA recruitment, according to demonstrator Jonathan Feldman G.
The protest moved to Lobby 7 at noon when it included approximately 60 participants, according to Gretchen Ritter G, one of the speakers at the rally. After a series of demonstrators delivered speeches in Lobby 7, the protest returned to the outside of OCS. The purpose of the speeches was to call attention to CIA violations of international law as well as international human rights, according to Feldman. An anti-CIA flier passed out from a Lobby 10 booth earlier in the week cites examples of alleged CIA activities which include the overthrow of governments in Guatemala in 1954, Chile in 1973, and the mining of Nicaraguan harbors last year. "The CIA is antithetical to the goals that we try to promote at MIT and in this country," Grossman explained. "Some of those goals are human rights, democracy, respect for democratically-elected governments, rights to privacy, and rights to free expression." "The CIA has had people on its payroll that were on death squads," Feldman indicated. "I was pleased with the kind of participation and solidarity that we had today," Ritter said. "The fact that we reached many people made it a success," Feldman agreed. Louis Menand III, senior lecturer in the department of Politi[mk1]cal Science and special assistant to the Provost, agreed that the CIA "has been involved in activities that run absolutely contrary to the spirit of American ideals." He qualified this, adding, "I do not know for a fact that the CIA has indeed violated international law." The Nicaraguan minings are presently the subject of an International Court of Justice case, Menand said. Until a verdict is reached in the case, we know only that the CIA has been engaging in activities that appear to violate international norms, he explained. Over 200 members of the MIT community signed a petition expressing opposition to CIA recruitment before Tuesday, Ritter said. Ritter delivered the petition to President Paul E. Gray '54 on Tuesday and spoke with Gray over the CIA issue. "It was important to tell him that a lot of students were opposed to the CIA recruiting on-campus," Ritter explained. "I was disappointed that we didn't make progress towards a commonality." Feldman contended that MIT should establish a policy of prohibiting governmental agencies which are "besmirched in illegality and immorality" from recruiting on the campus. "By allowing recruitment, the Institute is extending its resources to the CIA," he said. Weatherall said that the decision to interview with the CIA should be made by the individual student and not by the Institute. Many MIT students do not agree with the protesters, Weatherall continued. The CIA's activities repel some students, while others believe that the CIA's covert activities are necessary for preserving national security, he said. Very few people who work for the CIA are actually involved in covert activities, Weatherall added. Most are involved in information-collecting technology and information analysis, he noted. The protesters asserted that even those CIA employees who do not engage in covert activities are reponsible for the actions of the agency. "I think that people who work for the CIA who are not directly engaged in terrorist or anti-human rights activities are collecting information about groups that may be used later," Grossman said. "They're not killing anyone with a computer, but the information they collect may be used towards terrorist activities." Feldman compared such employees with German Nazi officers who did not actually commit atrocities during World War II but were still a part of the bureaucracy that directed the Nazi government. "It takes a lot of resources to carry out the CIA's activities," Feldman observed. Those employees who work in non-covert areas are needed to support those who participate in the CIA's secret operations," he explained. Weatherall emphasized that "the decision not to work for an organization because some part of the organization does something unethical or illegal is a decision that every student must make." Weatherall said that the issue of military/intelligence recruiting was first raised in 1968 when Dow Chemical Co., the manufacturer of napalm used in Vietnam, came to MIT to conduct interviews. A committee was appointed to determine what kinds of organizations should be permitted to recruit on campus. The committee decided to continue with the policy of providing "interview opportunities impartially to all bona fide employers -- industrial, academic, and government." In 1978, a committee was appointed by then-President Jerome B. Wiesner to look into the relationship of MIT to US intelligence agencies. This committee reexamined some of the issues concerning CIA recruitment, according to Menand, a member of the committee. "We don't feel that intelligence agencies should be treated any differently than other organizations in their open recruiting efforts," the committee re-affirmed in a 1979 report. Protester Nancy Otis G contended that the OCS already does place restrictions on what groups may interview on campus. Neither employment agencies nor organizations that charge potential employees a fee before hiring them are allowed to recruit on campus, she asserted. Weatherall explained that employment agencies are not considered to be genuine employers and are thus not permitted to interview at MIT. "We felt that employment agencies come in between students and the eventual employers," Weatherall explained. "It's beneficial to students and to MIT if we have the direct contact with companies." "Open access is still being violated," Otis maintained.